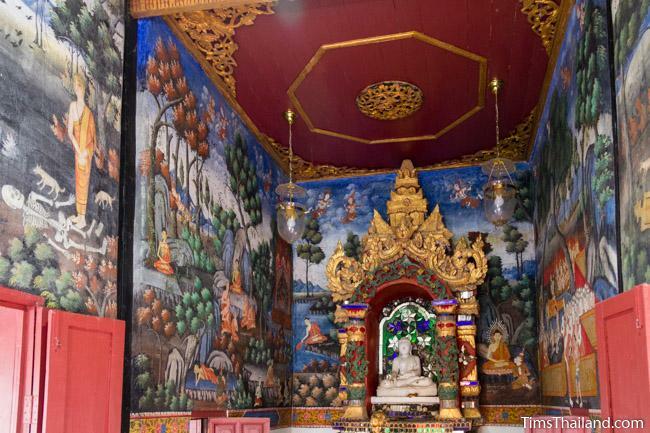 The small old ubosot at Wat Um Long in Thoen, Lampang province, is interesting and unusual in many ways. 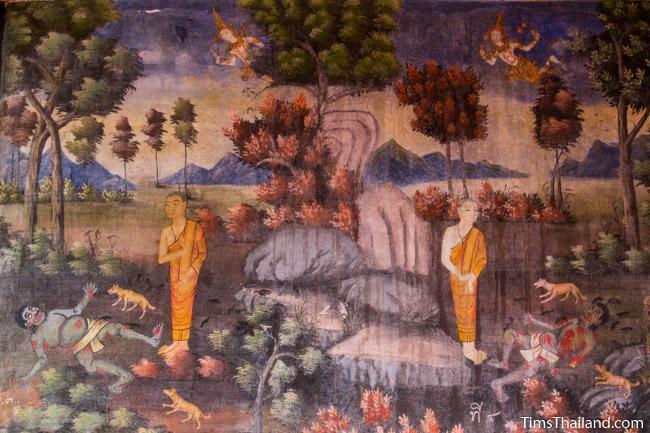 The most interesting for me is that the majority of interior wall space is covered with murals of a monk doing corpse meditation. 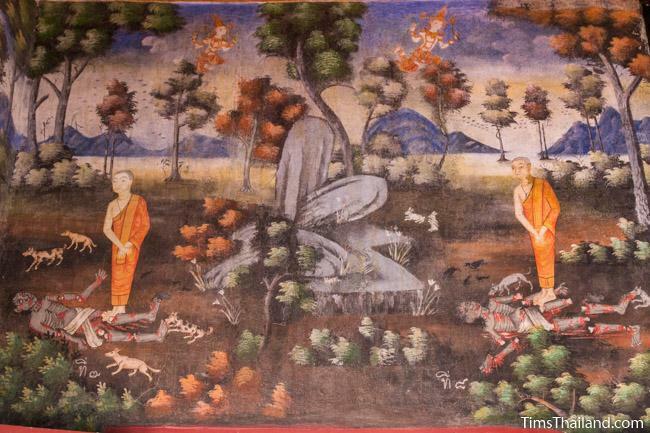 (The rest are scenes from the life of the Buddha.) This is not an uncommon subject matter for inclusion in temple paintings, but it's rare for it to be featured prominently. 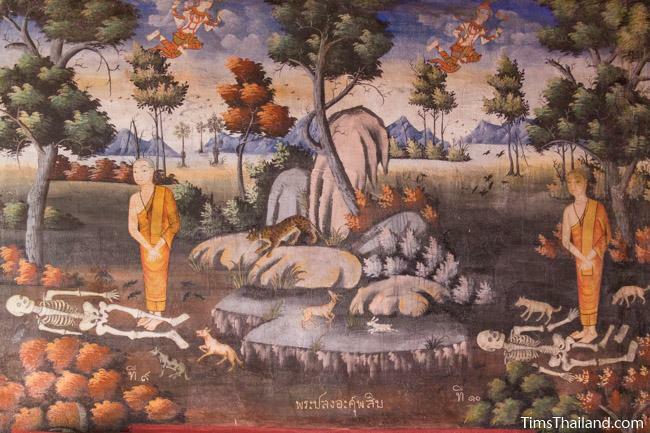 The Nine Cemetery Contemplations, as it's formally known, is a practice encouraged by the Buddha for understanding and accepting the impermanence of all things and is explained in detail in the Pali Canon. (9) if a monk sees a body thrown in the charnel ground, reduced to bones gone rotten and become dust, he then applies this perception to his own body thus: "Verily, also my own body is of the same nature; such it will become and will not escape it." …His mindfulness is established with the thought: "The body exists," to the extent necessary just for knowledge and mindfulness, and he lives detached, and clings to nothing in the world. 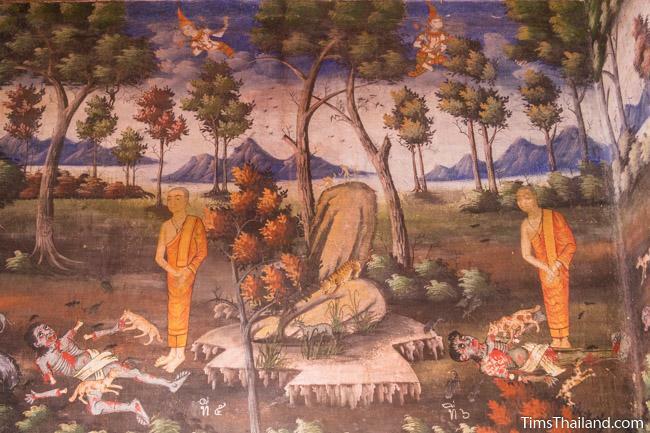 The Wat Um Long paintings go back to the mid-20th century, but corpse meditation is still practiced in Thailand by monks and lay people. 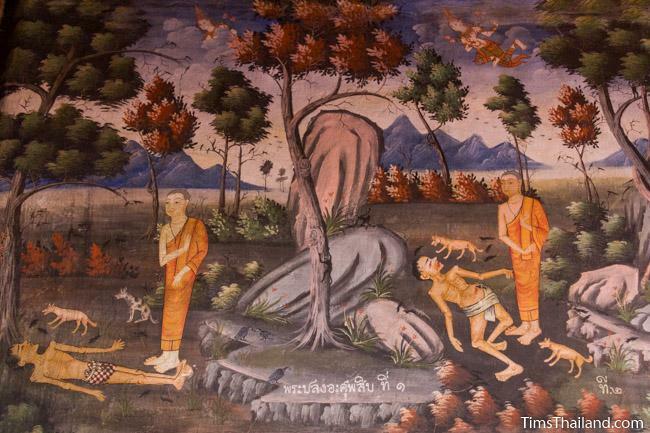 Though since there are no longer charnel grounds in Thailand, usually gruesome photos of decomposing corpses are used in place of actual corpses. But not always. Some temples are known for doing corpse mediation and families of people who die unexpectedly (such as in a motorcycle crash) want to give their spirits time to realize that they are dead, and thus the bodies will not be promptly cremated and are sometimes given to these temples to use for meditation; not unlike a family donating a body to medical science. Other times monks meditate in front of crypts and coffins without actually seeing the bodies. The Nine Cemetery Contemplations, is it in 1 place ? Yes, all of these paintings are in the same building.